Our gas & electric furnaces are amazingly energy-efficient! We can fix it! Our technicians service all makes & models. Our service plans extend system life & reduce energy usage! We install cutting-edge Carrier air conditioning systems. At Creative Comfort Solutions, our dedicated and skilled technicians are experts in heating installations, service, and repairs. Whether you need furnace, boiler, or heat pump services, we have you covered. Our team will help you keep your home and family warm, safe, and comfortable all winter long. You’ll always receive top quality care and attention from our technicians. We know that even in the hot summer months, it’s important to keep your heating system in great working order for the coming season. Contact our team today or check out our heating pages below to learn more! Summers throughout Delaware, Montgomery & Chester Counties can be muggy, hot, and uncomfortable. At Creative Comfort Solutions, we know you need a cool place to come home to, which is why our team provides professional air conditioning repairs, installations, and maintenance. We specialize in high velocity air conditioning systems and we’re experts in standard A/C units, heat pumps, and ductless mini splits. Our technicians are highly skilled and dedicated to keeping your home comfortable all season long. Get in touch with us today to learn more! For every style of home or unique comfort challenge, Creative Comfort Solutions provides the perfect solution. Our team of highly trained technicians are skilled and experienced in the installation, ongoing maintenance, and repair of a broad range of options, including boilers, furnaces, heat pumps, central air conditioning, mini splits, and high velocity air conditioning. We love nothing more than helping our customers in Delaware, Montgomery & Chester Counties eliminate space heaters, box fans, portable units, and extension cords, and enjoy total home comfort. If you’re renovating, putting on an addition, looking to upgrade, or live in an older home that lacks traditional ductwork, no problem. If you’re tired of excess humidity, drafts, and hot/cold spots in your home, we’ve got the answer. No job is too big or too small, and no situation too tricky. Our goal is your comfort, and we make it happen. If your home is not already outfitted with conventional ductwork, the fabrication and installation can prove too costly, messy, and disruptive to be worth the investment. If you’re putting on an addition to your home, fitting in ductwork may compromise your design. But trying to control temperature with open windows and portable options is inefficient, noisy, and unattractive. Creative Comfort Solutions specializes in high velocity systems, which relies on small, flexible tubing that weaves through tight spaces, such as ceilings, walls, and even floors, without renovation. Utilizing “aspiration” technology, small jets of air actively mix the air to create more even temperatures from floor to ceiling. Not only is the whole house maintained within your ideal comfort range, the temperature within individual rooms will vary by no more than two degrees from top to bottom. High velocity alternatives remove 30% more moisture from the air in cooling mode than standard air conditioning, providing relief from summer heat and humidity, and allowing higher thermostat settings for additional energy savings. Creative Comfort Solutions is comprised of highly trained, dedicated professionals who protect your investment, safety, and ongoing satisfaction with skilled and conscientious workmanship. Our team is NATE-certified, having verified their knowledge of advanced heating and cooling technology by passing a nationally recognized exam designed and promoted by the entire HVAC industry. A NATE-certified technician ensures accurate installation and service for maximum efficiency and performance from your heating/cooling system. In addition, our technicians are EPA certified in the safe handling and disposal of refrigerant. Fully licensed and insured, the specialists from Creative Comfort Solutions manage every aspect of the job with unwavering professionalism, including timely arrival, safeguarding surfaces from damage, and cleaning up when work is complete. If you are not 100% satisfied with our workmanship, we will take the necessary steps to make it right. At Creative Comfort Solutions, what you see is what you get. We do not under-price a job to then surprise you with hidden costs at the completion. We do not rely on subpar materials or cut corners in order to make a sale based on a reduced price. By partnering top quality equipment and materials with expert service, we offer competitive pricing without sacrifice. With Creative Comfort Solutions, you’re going to spend less to get more, and we’re so confident that we offer a Lowest Price Guarantee. You will not find a comparable installation for less. No other HVAC contractor meets our high standards for value, caliber, or price. If you should find a heating/cooling installation that meets our same criteria for less, we’ll pay a $100 bonus over the difference. With over fifteen years serving homeowners throughout Glenolden, Folcroft, Norwood, Prospect Park, Sharon Hill, Ridley Park, Folsom, Springfield, Woodlyn, Wallingford, Upper Darby, Havertown, Haverford, Wynnewood, Ardmore, Wayne & Radnor, PA, we have yet to write that check. Get the most reliable heating and cooling services throughout Delaware, Montgomery & Chester Counties with the dedicated Creative Comfort Solutions team! As a Carrier Factory Authorized Dealer, Creative Comfort Solutions routinely meets strict requirements for business practices, customer approval ratings, and product knowledge. Our technicians participate in ongoing factory training, adhere to rigid procedures for service and installation, and utilize Factory Authorized parts when possible. We specialize in the Carrier brand products we recommend, bringing our customers superior energy saving potential, innovative conveniences, and a broad range of options to answer any indoor comfort challenge. 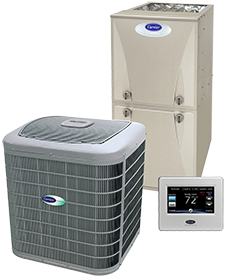 Outstanding warranties, rewarding durability, and meticulous engineering are standard features of these sophisticated heating and cooling systems. Through custom design, accurate installation, comprehensive maintenance, and prompt repair, Creative Comfort Solutions handles everything you need to keep your system operating in peak condition. And we are always prepared to deliver the exceptional service our customers have come to rely on, offering Emergency Service 24 hours a day, 365 days a year.